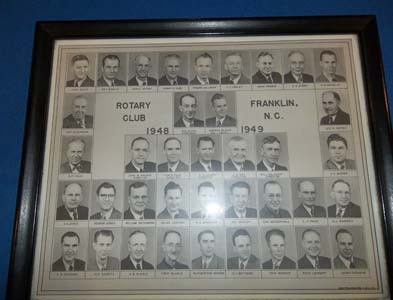 Rotary Club of Franklin members had a chance to look back on some history at the November 7th, 2012 meeting with a club member picture from the 1948-49 Rotary Year in Franklin. Member JC Jacobs is the only surviving member from that Rotary Year. 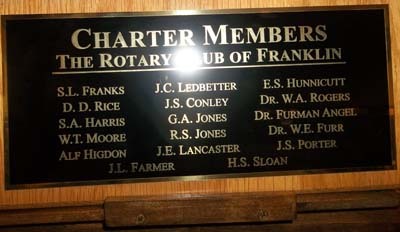 The Rotary Club of Franklin was formed November 10, 1927, under the sponsorship of the Waynesville Rotary Club. The first president was Sam L. Franks. At the time the Club was formed, Rotary International was only twenty-two (22) years old. In the eighty-five (85) years that have passed since then the hills of Western North Carolina have seen many changes, but Rotary has continued to be strong and vital in the town of Franklin. Im-proved transportation and communications have made neighbors out of the residents of coves and hollows as well as making neighbors of a much larger portion of the state, the nation, and the world. The club has moved beyond its isolation in a valley that was more accessible to North Georgia than it was to the rest of the state of North Carolina. We have had strong leaders representing us in the legislative halls of Raleigh as well as in the Congressional passages of Washington. So has our involvement in Rotary that has expanded over the last eighty-five years. We are especially proud of the fact that we have reached beyond ourselves to form new clubs in our part of the state. Clubs in Bryson City (founded January 6, 1934), Highlands (founded May 2, 1945), a second club in Franklin (Daybreak Rotary Club founded December 1, 1997), and a club in Hayesville (Clay County Rotary Club founded June, 9 2011). All were sponsored by the Franklin Rotary Club. The Club reached out to bring in women as members in the latter part of the 1980s. Its first woman president took office in 1996, the second in 1998. Much of our paper history has been lost over time, but the spirit which is the life of Rotary around the world continues to permeate the Franklin Club through its members, its leaders and its constant pursuit of service above self. There continues to exist today, a very active Interact Club at Franklin High School. 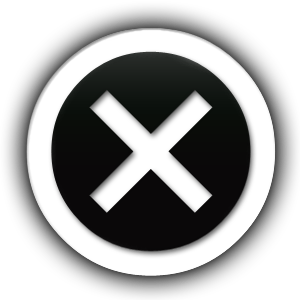 The club has been welcomed by school administration for a number of years. The school has provided active and enthusiastic support. This club has sponsored Boy Scout Troop 202 for over 70 years. For many years the troop’s scoutmaster and the BSA Daniel Boone Council’s District Executive for this scouting committee were members of the Franklin Rotary Club. A scouting committee has been part of our Community Service area. Over the years, club members have volunteered for community betterment projects such as a clean river (the Little Tennessee) and support of a Greenway along the river. The club’s major fund-raising project for several years has been to provide funds for scholarships to students graduating from Franklin High School. Several years ago leadership of the club challenged members to raise $100,000 as a base for an ongoing scholarship program. The goal was reached through several years of holding a raffle (The Roy Rickman Scholarship Raffle- where a truck or automobile is raffled off). All of the monies – after meeting the expenses of the raffle (including the printing of the tickets that sold for $100 each, advertising in the local papers and on radio, a barbecue dinner at which each ticket was drawn) – were invested to produce funds to give four year scholarships to a student selected from the graduating seniors at Franklin High School. The scholarship has gradually increased to meet the increasing cost of education. In the years when investments paid good dividends, we have increased the number of scholarships given. In years when the market was down, more tickets were sold (up to 400 per year). The increasing cost of the vehicle given has also kept the number of tickets sold up to 400 each year. Members have traditionally worked with the school system as tutors providing opportunities for students to explore jobs through “shadowing;” participated in career day activities as part of our Vocational Services emphasis. Rotarians have visited the local Middle School to share the “four-way-test” which will be the subject for student essays, to be judged by teachers with prizes presented by the club in the middle of the school year. Over time, the club has become involved beyond our own community. One of our members has been District Governor (Dennis Sanders in 2001 – 2002). Another has been made District Governor Nominee for 2014-2015 (Gary Bray). Dennis has long been active in District 7670, at one time shepherding the student exchange program. This club has enjoyed hosting several exchange students and sending out students from the area to other countries. One of our outbound students (to Spain) went on to become an Ambassadorial Scholar (to Mexico). We have had a special summer exchange program with Austria through Dennis’s leadership. Rotary projects have been pursued beyond U.S. borders – wheelchairs for Guatemala, an all-terrain-type ambulance for South Africa to reach areas where medical care is needed, and others. We have been able to send our presidents-elect to the International Conventions for many years – Canada (1996), Scotland (1997), Singa-pore (1999), Venezuela (2000), San Antonio (2001), Madrid (2002), Chicago (2005), and on and on . . .We are currently in the midst of a serious campaign to increase our club membership through aggressive outreach into the community. Bright, young leaders are emerging with creative ideas for continuing the vibrant life of the Franklin Rotary Club over the next seventy-five years. 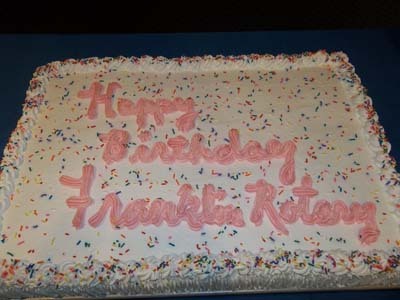 The Franklin Rotary Club celebrated its 85th birthday in November of 2012. Its involvement in District 7670 continues. Past involvement includes members who have served on district committees. The Club has inducted two past district governors from other districts into its membership. “New blood” with expanded experience in Rotary is always welcomed. We are also particularly proud of the breadth of our member classifications, since we believe that this is indicative of the original intention of the organization of Rotary. The Franklin Rotary Club is alive and well after eighty-five (85) years of experience, and looking forward to the next eighty-five!